The Arts Engagement Certification is designed to equip undergraduate students with the tools they will need to be lifelong participants in the arts. Regardless of their major or previous level of involvement with the arts, students in this program will be able to fully immerse themselves in the rich art culture available to them here at KU. Students will leave this program with a broad exposure to different types of art and the ability to appreciate and intelligently discuss that art. Most importantly, they will leave KU with a passion for the arts and the ways it can enrich society. The Arts Engagement Certification joins the Global Awareness Program, Research Experience Program, Leadership Studies Certificate, Entrepreneurship Certificate, and Service Learning Certification in encouraging students to seek out learning opportunities beyond the traditional classroom. What kinds of students participate? The Arts Engagement Certification is designed to be accessible for students in any major and with varying levels of previous experience in the arts. Through the required courses and instructional materials available on our blackboard site, students will be given the tools needed to meaningfully engage with various types of artwork. The only requirement is that the student is an undergraduate at KU. Whether they are psychology majors with no previous experience in the arts, business majors who want to reconnect with an earlier passion for painting, or film majors who want to broaden their arts education, any student can participate in this certification! 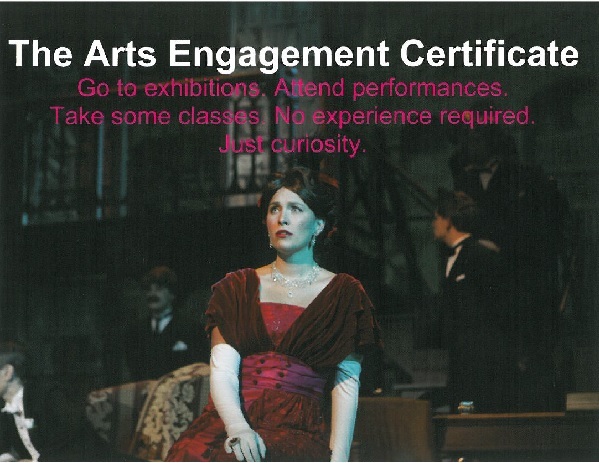 Apply for the Arts Engagement Certificate today!